By Dr. Kate Rawlinson Corals are central in many marine food webs, with numerous invertebrates and vertebrates predating on them. Coral-eating invertebrates outnumber their fish counterparts nearly 3 to 1 [1,2]. In the wild, most small animals that live and feed on corals have negligible, if any, ill effects on the coral host . However, in aquaria, where corals may be stressed and the diverse food webs of the reef are hard to recreate, inadvertently introduced coral predators can rapidly kill off their prey. One such coral predator is the notorious Acropora-eating flatworm (AEFW). Despite its long-standing infamy among hobbyists, the AEFW is relatively new to science. In 2011, we described the AEFW as a new species of polyclad flatworm, Amakusaplana acroporae , and in 2012, we discovered it in the wild for the first time (on the Great Barrier Reef, Australia) . Aquarists and hobbyists were instrumental in bringing this animal to the attention of scientists, and in continued collaboration with hobbyists, we hope to carry out experiments in aquaria and in the field to get a better understanding of AEFW biology and ecology. This, in turn, will help us develop more effective ways to control this destructive pest. In this article, I will introduce the AEFW to you (from a flatworm biologist’s perspective), summarise what we currently know about the AEFW’s anatomy, reproductive biology, and life cycle and highlight some of the questions we will address in the future. In this same issue, Paul Whitby in his ‘pest-free reef keeping’ article will talk more technically about how to deal with these pests (or interesting worms!). Figure 1. The evolutionary position of the AEFW in relation to other animals. This schematic is a simplified evolutionary tree of our current understanding of animal relationships based on analysis of multiple sequences of DNA. What is the AEFW and Where is it Found? The AEFW is a polyclad flatworm. These flatworms are a group of marine worms belonging to the phylum Platyhelminthes (a phylum is the term for a large group of related animals, like molluscs or arthropods). The phylum Platyhelminthes includes several free-living groups (such as the polyclads, and triclads or planaria) and also many parasitic species (such as tapeworms, liver flukes and schistosomes). At first glance polyclads, with their simple morphology and flat body shape, are often mistaken for other invertebrates such as nudibranch molluscs or acoel worms. Indeed, acoels (e.g. 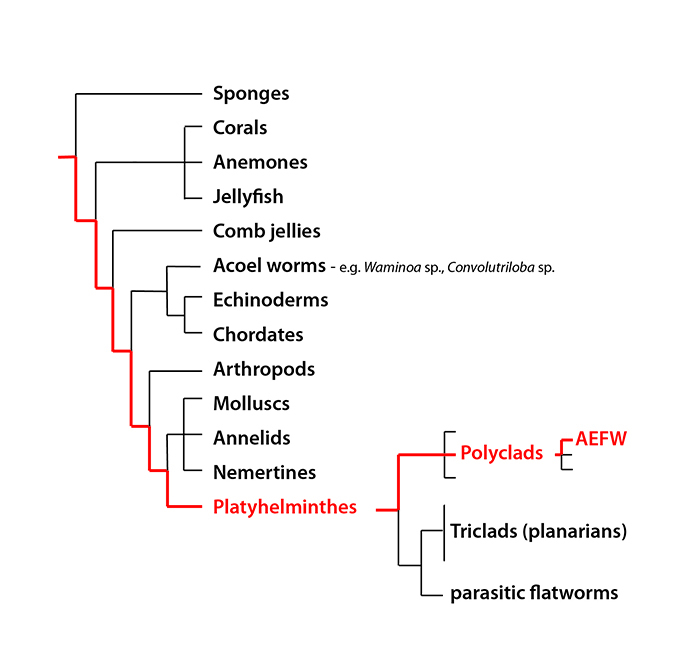 Convolutriloba and Waminoa species that are common in reef tanks) were once thought to be flatworms, but a recent re-analysis of the animal evolutionary relationships (Figure 1) has revealed that they are not closely related at all. Polyclad flatworms range in size from microscopic to over 10 cm in length. They are found in all oceans, from the shoreline to the deep sea, and from the poles to the tropics. Although the AEFW has been a problematic pest to coral hobbyists in the Americas, Europe and Australasia for the past decade, it had not been previously recorded in the wild. So, in an attempt to locate it in its natural habitat we (aquarists, hobbyists and myself) drew up a list of all the Acropora species affected by the AEFW (Acropora valida, A. pulchra, A. millepora, A. tortuosa, A. nana, A. tenuis, A. formosa, A. echinata, A. yongei), mapped their collective natural distributions, and saw that they are all small polyp species found in the Indo-Pacific region. My collaborator, Jessica Stella (James Cook University, Queensland, Australia), then went to her study site in the Lizard Island lagoon, northern Great Barrier Reef, and randomly sampled 10 colonies of Acropora valida. To our surprise, the AEFW was present on 7 out of the 10 colonies with an average of 2-3 worms per colony. We had imagined that looking for the AEFW in the wild would be like looking for a needle in the haystack – but we struck gold the first time! Our initial observations suggest that the AEFW is common, but not very abundant (2-3 animals per colony compared to the 100s of individuals found on heavily infested colonies in aquaria). Locating the AEFW in the wild, and in the vicinity of the Lizard Island Research Station, will now allow us to study it’s ecological interactions, assess its impact on the reef and determine how it’s population size is kept in check. These experiments will hopefully shed light on potential biological controls that can then be used in closed systems. Sophisticated Predatory Worms – Adaptations to Corallivory? Adult polyclads predate on a variety of marine invertebrates, including molluscs [6,7,8], sea squirts [9,10,11,12,13], crustaceans  and cnidarians [15,16,17]. Some of these prey species are commercially important for the food (e.g. the oyster, Crassostrea rhizophorae, and mussel, Mytilus galloprovincialis) and for the aquarium industry (e.g. the giant clam, Tridacna gigas and corals of the generaAcropora and Montipora). While some polyclad species are generalists, feeding on a wide variety of animals, others prey specifically on just one prey item. These flatworms often exhibit cunning tools to capture and eat their prey, such as the use of the deadly neurotoxin, tetrodotoxin, to paralyze mobile prey such as gastropods . Figure 2. Live AEFW adult on Acropora species with cluster of feeding scars to right (arrowheads) (scale =5 mm). The AEFW takes circular bites out of the Acropora tissue by everting its tube shaped pharynx and sucking (or digesting using enzymes) the coral tissue out from the skeleton. The coral tissue is then passed from the pharynx through to the main branch of the gut, where it is distributed along the lateral bifurcating branches of the digestive tract. 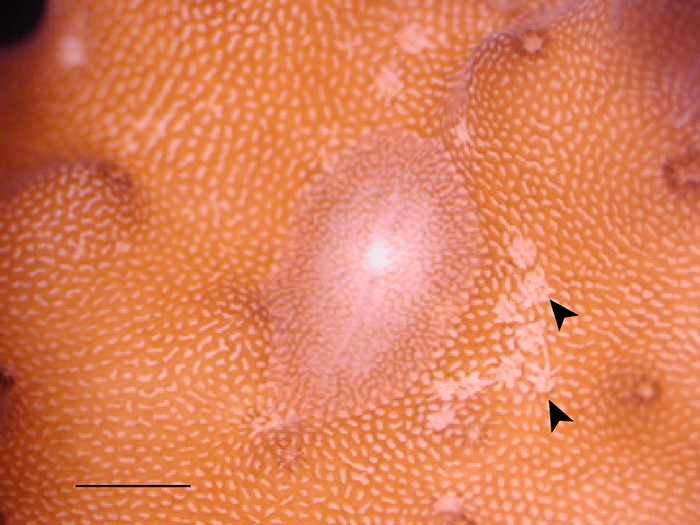 Polyclads get their name from their highly branched gut (poly = many, clad = branch) and it is the coral tissue and zooxanthellae in the gut branches that camouflage the AEFW so well against the coral (figure 2). The AEFW’s tubular pharynx is unusual because it has a deep cleft that runs along its length (figure 4a). The only other polyclad with a cleft pharynx is Prosthiostomum montiporae, which also feeds on coral (Montipora verrucosa – [16,17]). We think that this type of pharynx, once protruded, may be opened along the cleft and spread over a broad area for more efficient feeding, and might have evolved specifically as a mechanisms for feeding on uneven coral surfaces. How the AEFW avoids and/or survives the coral’s defenses (e.g. nematocysts and mucous layers) is unknown. From looking at the microscopic tissue sections of these worms, the nematocysts that are present in the gut appeared unfired (figure 4b) and there is no evidence that these worms are using the stinging cells in their own defense against predators. It is also not known whether the zooxanthellae (Symbiodinium) from the coral are simply digested by the AEFW, or whether they live as symbionts in the worm, providing an additional source of nutrition. Understanding how long the AEFW can survive without Acropora will be important for knowing how long to keep a tank Acropora-free to kill off any worms. Figure 3. (a) live AEFW adult (photo by Joseph Weatherson), (b) cleared wholemount of AEFW, (c) schematic of (b) showing anatomy of AEFW, (d) schematic of the digestive system in blue, this is a very simplified illustration as the gut branches form a very intricate network of canals. Figure 4. Cross sections through an AEFW showing (a) the cleft tubular pharynx, (b) Acropora nematocysts and zooxanthellae in the main tract of the AEFW gut. There is currently little empirical data available on which species feed on polyclad flatworms. Reef fish, such as the moon wrasse (Thalassoma lunare), have been reported to feed on polyclads in the wild , and adult AEFWs are often eaten by various fish species (e.g. Halichoeres chrysus, H. iridis, Macropharyngodon ornatus,Labroides dimidiatus, Synchiropus ocellatus and S. splendidus, Jason Jenkins, pers comm) when dislodged from the coral. Paul Whitby discusses current AEFW biological controls in detail (see his article in this issue), but it is important to note that the AEFW probably has different predators at different stages of its life cycle. Consequently, we hope to carry out additional experiments to figure out what eats it, and when. Reproduction and Life Cycle All polyclads are hermaphrodites (i.e. all individuals possess both male and female reproductive structures), but they are not known to self-fertilize. Eggs are protected from the environment and predators by an egg capsule, and multiple egg capsules form an egg plate (or batch), which is glued onto a substrate. The time to hatching can be between 5-25 days, depending on mode of development and environmental conditions, such as temperature. Some polyclad species undergo indirect development, and hatch as a larva that feeds in the water column before settling to the seafloor and metamorphosing into an adult. This larval stage might increase the dispersal potential of the species and maximize the chances of finding a suitable adult habitat. Other species develop directly from embryos into adults (bypassing a larval stage), and as a result, have a more limited dispersal potential. Finally, there are intermediate modes of development that are neither direct nor indirect, as is seen in the AEFW (see below). Mature AEFW can get up to 2-3cm in length and, as you can see by the number and distribution of eggs in figure 3 (b&c), they are very fecund. How many offspring an adult can produce is not known, but it is probably near to 1000. They reproduce sexually, but whether it is by hypodermic insemination (injection of sperm through the skin) or copulation (you know how this works!) is not known. The AEFW puts multiple embryos (between 3-7) into each egg capsule (figure 5a) and these capsules are glued onto the bare coral skeleton, normally near the base of the colony (figure 5b). The length of development inside the egg capsule is approximately 21 days at 76–78F (at 25C). Figure 5. 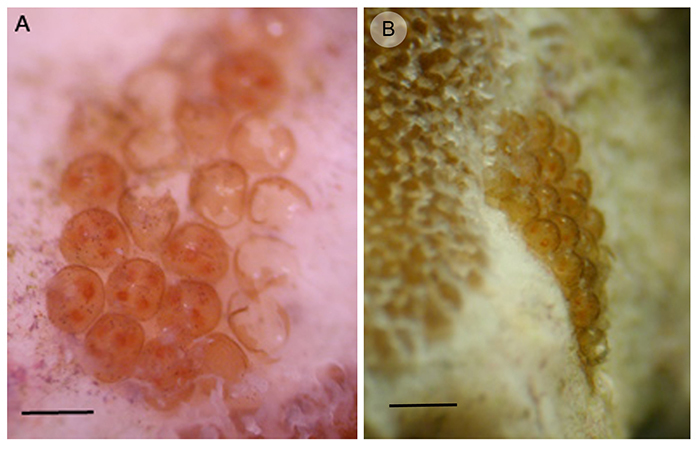 (a) Egg batch with some hatched capsules and others containing between 3 and 7 embryos (scale = 1 mm), (b) Egg batch attached to the coral skeleton next to live coral tissue (scale = 2 mm). We have only studied AEFW development and life cycles in aquaria so far, but what we’ve discovered is very interesting. AEFW hatchlings (figure 7a) are very small (250–300m in length and 110–130m in width, i.e. 0.3mm x 0.1mm), and once hatched, they ‘swim’ into the coral skeleton, where they start feeding on the coral tissue immediately . AEFWs seem to undergo ‘direct development’ hatching out of their egg capsules as sexually immature juveniles with the same body plan as the adult and bypassing a larval stage. Direct development would imply limited swimming ability and low dispersal potential. However, when we studied their embryonic development we noticed that the embryos were developing larval features. These include ciliary tufts and lobes, which normally facilitate swimming and feeding in the water column (figure 6e). However the AEFW embryos were losing these larval features and undergoing metamorphosis in the egg capsule prior to hatching. This process is known as ‘intra-capsular metamorphosis’ and is a type of intermediate development (i.e. neither indirect nor direct development). This would suggest that the AEFW is delaying hatching until after metamorphosis, thereby reducing dispersal potential and retaining offspring in or near its natal habitat, and food source. Perhaps retaining offspring on their food source is a better reproductive strategy than letting them swim off to find their own Acropora colony, which on the reef can be very patchily distributed. An alternative (and whimsical) scenario is that intra-capsular metamorphosis is an adaptation to life in aquaria. If they hatched out as larvae, swimming in the water column, they would get filtered out, so only the individuals that hatch late and stay on the natal coral survive to reproduce! We need to sample hatchling stages from many more egg batches in aquaria and in the wild to see if all individuals undergo intra-capsular metamorphosis. There is a chance we might see some individuals hatching as larvae and others as juveniles and this may either be a bet-hedging strategy (backing both odds: retention and dispersal) or there may some environmental cue determining the time of hatching. Figure 6. (a) Live AEFW embryo pre-hatching, (b) AEFW embryo stained with an antibody that is used to visualize cilia (hairs) – shows ciliation of the entire surface of the animal including longer ciliary tufts on the larval lobes, (c) AEFW embryo stained to show it’s muscles, note protrusion of larval lobes, (d) Live AEFW hatchling, (e) and (f) hatchlings with cilia and muscles stained, note loss of lobes and ciliary tufts. Scale bars 50 m. (CLSM–confocal laser scanning microscopy). Invertebrates: Diversity, Ecological Importance and Vulnerability to Disturbance. Oceanography and Marine Biology: An Annual Review, Vol 49: 43–104. 3. Castro P (1988) Animal Symbioses in Coral-Reef Communities – A Review. Symbiosis 5: 161–184. 4. Rawlinson K, Gillis J, Billings R, Borneman E (2011) Taxonomy and Life History of the Acropora-Eating Flatworm Amakusaplana acroporae; nov. sp. (Polycladida: Prosthiostomidae). Coral Reefs 30: 693–705. 5. Rawlinson KA and Stella JS (2012) Discovery of the Corallivorous Polyclad Flatworm, Amakusaplana acroporae, on the Great Barrier Reef, Australia – the First Report from the Wild. PLoS ONE 7(8): e42240. 6. Pearse AS, Wharton GW (1938) The Oyster ‘‘Leech’’ Stylochus inimicus Palombi, Associated with Oysters on the Coasts of Florida. EcoI Monogr 8:605–655. 7. Littlewood DTJ, Marsbe LA (1990) Predation on Cultivated Oysters, Crassostrea rhizophorae (Guilding), by the Polyclad Turbellarian Flatworm, Stylochus (Stylochus) frontalis Verrill. Aquaculture 88:145–150. 8. 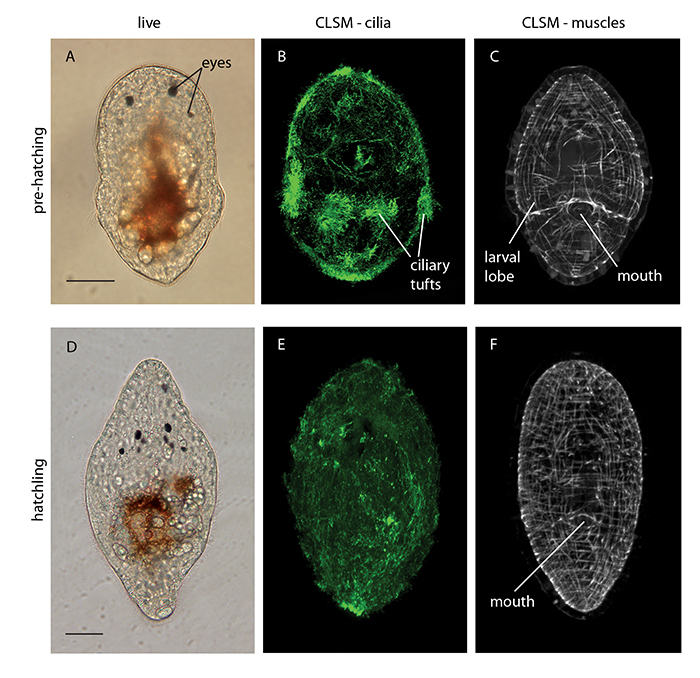 Ritson-Williams R, Yotsu-Yamashita M, Paul VJ (2006) Ecological Functions of Tetrodotoxin in a Deadly Polyclad Flatworm. Proc Natl Acad Sci USA 103:3176–3179. 9. Crozier WJ (1917) On the Pigmentation of a Polyclad. Proc Am Acad Arts Sci 50:725–730. 10, Millar RH (1971) The Biology of Ascidians. In: Russell FS, Yonge M (eds) Advances in Marine Biology, 9. Academic Press, New York, pp 1–100. 11.Newman LJ, Cannon LRG (1994) Pseudoceros and Pseudobiceros (Platyhelminthes, Polycladida, Pseudocerotidae) from Eastern Australia and Papua New Guinea. Mem Qld Mus 37:205–266. 12. Baeza JA, Veliz D, Pardo LM, Lohrmann K, Guisado C (1997) A New Polyclad Flatworm, Tytthosoceros inca (Platyhelminthes: Polycladida: Cotylea: Pseudocerotidae) from Chilean Coastal Waters. Proc Biol Soc Wash 110:476–482. 13. Newman LJ, Norenburg JL, Reed S (2000) Taxonomic and Biological Observations on the Tiger Flatworm, Maritigrella crozieri (Hyman, 1939), New Combination (Platyhelminthes, Polycladida, Euryleptidae) from Florida Waters. J Nat Hist 34:799–808. 14. Murina G-V, Grintsov V, Solonchenko A (1995) Stylochus tauricus, a Predator of the Barnacle Balanus improvisus in the Black Sea. Hydrobiologia 305:101–104. 15. Kawaguti S (1944) Zooxanthellae as a Factor of Positive Phototropism in those Animals Containing Them. Palao Trop Biol Stn Stud 2:681–682. 16. Jokiel PL, Townsley SJ (1974) Biology of the Polyclad Prosthiostomum (Prosthiostomum) sp., a New Coral Parasite from Hawaii. Pac Sci 28:361–373. 17. Poulter JL (1975) Hawaiian Polyclads: Prosthiostomids I. Pac Sci 29:317–339 18. Ang HP, Newman LJ (1998) Warning Colouration in Pseudocerotid Flatworms (Platyhelminthes, Polycladida). A Preliminary Study. Hydrobiologia 383: 29-33.